Who can resist the Panpole/Neer Dosa? The Panpole (pronounced as pun-polay) as it’s called in Konkani and ‘Neer Dosa’ called in Tulu/Kannada is everybody’s favourite. 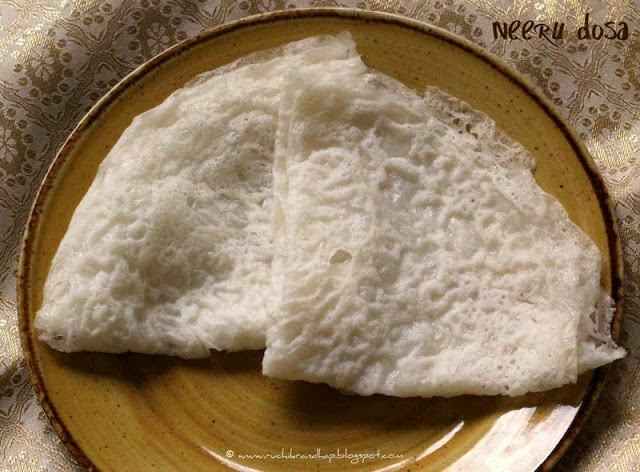 Neer Dosa derived its name from the term ‘Neeru’ which means ‘Water’ in the local languages of Mangalore namely Kannada & Tulu. The watery consistency of the batter is what’s behind the name. Its the Neer Dosa’s simplicity and ease of preparation that has reigned supreme in every Mangalorean house and has gained a lot of popularity outside Mangalore too. In Mumbai, the Neer Dosa is famous in all seafood restaurants irrespective of whether the propreitor is a Mangalorean or not. However, this simple bread is sold at an exhorbitant price – so it’s quite ridiculous to order these pretty dosas as they cost about Rs 25 per plate (with just 2 dosas staring back at you). Also, the restaurant’s version of the dosa usually does not turn out the way it is made at home. Dosas are essentially characterised by the ‘holes’ that form either due to air bubbles or fermentation – so in that respect what they serve you are pretty flat ones. However, if you have never tasted these simple & frilly dosas which are thin & delicate like a lady’s handkerchief – go try some at once! The Neer Dosa/Panpole are eaten for breakfast along with chutney or gravies, some like to enjoy it with leftover curries or a side dish of vegetables. These dosas are so versatile that they can be also introduced during ,meal times as an accompaniment to meat/fish dishes. Leftover ones can be rolled up like Kati Rolls with a sweet filling made of fresh coconut & sugar/jaggery. My son loves them plain or with a generous splash of honey. One can never get tired of eating these simple dosas and the best tasting ones are made in cast iron griddles which are kept aside only for these dosas. Cook anything else in these special griddles and they are deemed useless forever as the dosas will never turn out easily and will stick horribly to the griddle. 3. Add salt to taste and mix well. 4. Heat a cast iron or non stick griddle/tawa which should have edges (not the one used to make dosas which are without edges). Lightly grease the surface of the griddle with oil – you can poke 1/2 a medium size onion with a fork and use it to grease the griddle. Many people use a small piece of muslin tied to a stick to do the same, but it’s more hygienic to use an onion and discard it after use. 5. Using a deep round ladle scoop out batter & pour it on one side of the griddle and lift quickly lift & tilt it to help spread the batter across the entire surface of the griddle. This needs minimum practice. Add more batter in places which are not covered with batter. Cover & cook for about one minute or till you see the dosa leaving the sides of the griddle. 6. Remove and allow to cool a bit before folding into a quarter. 7. Serve with Chutney, gravy, Chicken or Fish curries and simply enjoy this simple delicacy! Aahh..lovely dosas Shireen..light, and full of flavours. Vow what a lovely dosa variety, looks so soft and light. Hi Shireen, Found my way to your blog from Michelle's Food, Football and a baby. Love all your recipes.. and have tried a few of them.I'm mangalorean as well.. but living far away form home now :-(.. so ur food definitely gets me nostalgic and inspires me to try out.. keep them coming !! Wow neer dosas are my favourite. Its been a long time since I have made these. After seeing these pictures, I am very tempted to make and eat some straight away. Awesome recipes. Have never made kuswar untill now. No errors, purrfect nevris and kulkuls!! Also pork bafat..yummmmm. Lots of appreciation received for this dish. Thanks a lot, keep posting. How long does this batter last? A week? Hi Evita: What kind (variety) of raw rice did you use? Sometimes if the rice used is not correct it can turn sticky and won't lift off the pan easily. Secondly, did you grease the pan with oil? Hi Shireen, I have a similar problem as the previous commenter, it sticks and cracks in the pan before lifting it up. I used Sona masoori rice and a little desiccated coconut. After the rice is soaked overnight, is the rice ground in the water it was soaked in, or is fresh water used to grind the rice? Please reply. Tina: You can grind the rice using the water which was used to soak the rice provided it was not tap water (to be on the safer side) and also provided the rice was adequately washed and then soaked in that water. Could the cracking in the pan be due to an extra thin batter? And the stickiness due to inadequate heat beneath? A lot of times it helps to stir the entire batter eachtime just before pouring out on the griddle. Thanks for your recipe. My question is, can I use basamati rice for this ? Lorraine & Amanda: You can use basmati as it is a variety of raw rice but it may work out too expensive! Try looking for Kolam rice or broken basmati which will be cheaper. 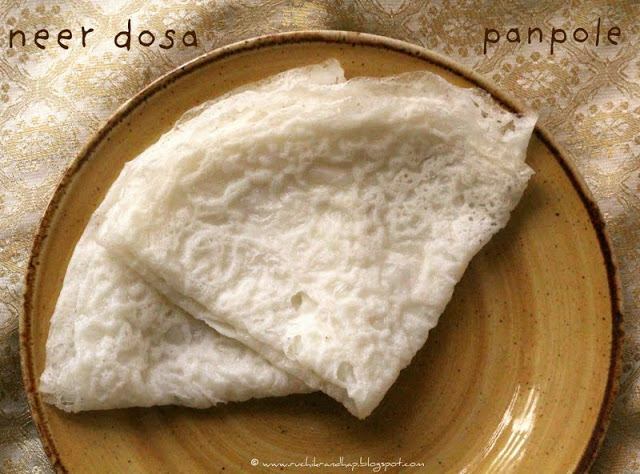 (A) In the 'Panpolay/Neer Dosa' method, you have stated :"4. Heat a cast iron or non stick griddle/tawa which should 'HAVE' edges (not the one used to make dosas which are without edges)"
(B) In the 'Tri Coloured Neer Dosa / Panpolay' you have stated, " Heat a neer dosa skillet or a very flat non stick frying pan 'WITHOUT' tall sides". Instead of soaking the rice and then grinding, do you think I can just use raw rice powder and mix with water, (along with some cooked rice and coconut that are pre-ground in a mortar)? You need to have a skillet that has edges but not very tall edges – cuz we use frying pans to fry fish that have really tall edges. We also use slightly concave tawas without any edges to fry regular dosa (masala dosa type). Since the neer dosa batter requires to be swirled around a bit we need a flat (not concave) tawa with small edges. And no, I am not sure how the rice powder neer dosa will turn out for you as my experience was never good with it. Hi Raveena…did you mean ‘idli rice’? If yes, neer dosa is best made with raw rice. Idli rice would be the parboiled variety and not suitable for neer dosa. Please check your grocery for ‘dosa rice’ or ‘kolam variety of raw rice. Hope it helps! Do let me know!